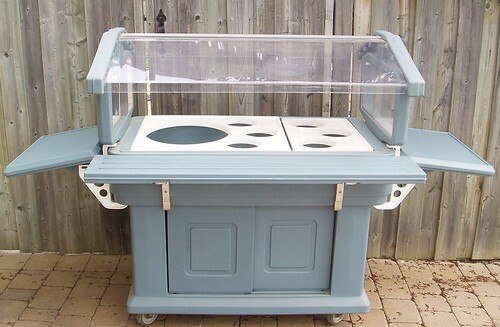 A friend of mine is selling this great portable salad bar. It's ideal for small spaces and also can be used as a buffet for private parties. Cambro's Ultra Bar can go anywhere and serve anything. Foam insulation provides excellent temperature retention for hot or cold foods. Sliding doors on both sides provide easy access to ample storage area. Sneeze guards and end panel shields help to protect food. Ultra Bars are portable, durable lightweight and easy to clean. I took the photo below yesterday, so what you see is what you'll get. Contact me if you have an offer or if you want to check it out in person. A little online searching reveals that the Cambro Ultra Food Bar will cost you over a grand brand new, so this could be quite the deal. But remember this... you can't make friends with salad. Write me and I'll put you in touch with the seller. The Salad Bar has been sold! I am interested in the salal buffet. What is the lowest you will go on it.